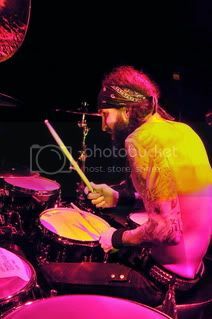 Drummer TOMMY CLUFETOS - "I’m A Straight Ahead Rock ‘N' Roller And So Is OZZY; It Totally Works Perfect"
The name Tommy Clufetos might not pop to mind when first thinking of great rock drummers, but the Detroit native has quietly made a name for himself as one of the best among the rock elite. 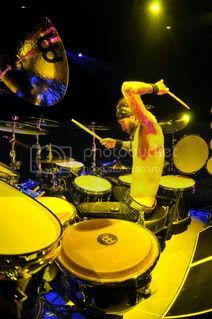 In the last decade, Tommy has toured and recorded with TED NUGENT, ALICE COOPER and ROB ZOMBIE. This past year, he could be heard pounding out the beat for rock icon, OZZY OSBOURNE. Bravewords.com recently caught up with the man behind the skins to find out more. 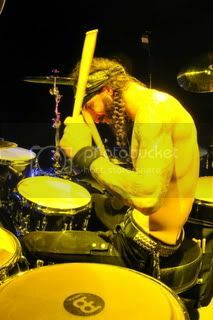 Bravewords.com: You quit Rob Zombie’s band to join Ozzy. How has it been adjusting to Ozzy’s style of drumming? Bravewords.com: Was it intimidating the first time you were in rehearsals with Ozzy? Bravewords.com: You’ve been on the road with Ozzy for eight or nine months now. How has it been going? Bravewords.com: While you are on the road. Are you working on new music? Will there be another new Ozzy album soon? Bravewords.com: How much did you contribute to the recording of Ozzy’s last album, Scream? Bravewords.com: I was under the impression that you had played on the album. Are you looking forward, then, to actually playing on an Ozzy album? Bravewords.com: Let’s go over your history. You played with Alice Cooper. Tell me about it. Bravewords.com: That’s got to be tough to do as a ‘gun-for-hire’… to keep the gigs coming. When the Ozzy tour winds down, will you have something else lined-up to fill in the down time? Bravewords.com: Have you ever thought of forming your own band rather than always playing in somebody else’s band? Bravewords.com: Growing up in Michigan, did you have a band for ten years then move on to Ted Nugent or have you always moved from band to band? Bravewords.com: How did you go from doing those locals gigs to landing the job with Ted Nugent? Bravewords.com: You remind me a lot of KISS’ Eric Singer. He seems to have the same approach to his gigs. Bravewords.com: You’re not interested in putting in your own fills on songs or making them your own? Bravewords.com: It really does and this ‘new’ band has reignited my passion for Ozzy. I had really giving up on Ozzy in the last six or seven years. I didn’t like the albums, but I was more disappointed with the live show. However, the show I saw (back in November or December) was with a band firing on all cylinders. It was fantastic. Let me go back to the other guys you’ve played with. Tell me about Ted Nugent. Bravewords.com: How did Ted find you? Bravewords.com: It might be up for debate, but musically Ozzy, Alice and Ted are somewhat similar. Rob Zombie, however, is different. How was it playing with Rob? Bravewords.com: Was it challenging for you? Bravewords.com: Is there any one of those styles that you prefer? Bravewords.com: Hopefully, that’ll be the mentality you’ll bring in to the studio for Ozzy’s next record. Four guys on the floor, plug in, play and hit record. Bravewords.com: I think the potential is there. Bravewords.com: Do you have a preference between playing the Ozzy songs or Sabbath songs? Bravewords.com: Will you be recording any shows for a live DVD or CD? 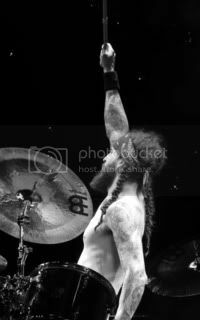 Bravewords.com: Let’s plug… The website is Tommyclufetos313.com. Bravewords.com: Any bands you’d like to play for? Bravewords.com: If Eric Singer got sick would you put on the Cat make-up and play for KISS for a night? Bravewords.com: Any favorite songs to play live? Bravewords.com: On the current Ozzy tour, you guys sound live and raw, but not sloppy and to me that’s perfection. That’s rock ‘n roll.